Given how many games release on Switch every week, it’s sometimes difficult to find the best games on the eShop. Here’s some great Switch games you may not have tried. Note: this article originally ran on 9/14/17, but has now been updated with newer picks. This quirky hidden object game is surprising the entire way through. There’s something about it’s sense of humor that just delights. In Mom His My Game!, you’re tasked with solving some short puzzles in order to find your Nintendo DS, which has been hidden by your mom. You’ll find it in bizarre places—in a crocodile’s mouth, in elephant dung and inside a balloon. These don’t feel like random solutions. You just have to embrace the joke this game is telling. If you’ve already played this on mobile, it’s still worth picking up for the new puzzles. I was pleasantly surprised by this dungeon crawling party game. In Crawl, you play as an adventurer in a dungeon that’s plagued by monsters, until you die and get to play as the monsters. It’s nasty and a little mean—you can be resurrected by killing the hero, but only the player who kills them can come back. So even if you’re all trying to accomplish the same goal, no one’s ever really on the same side, and loyalties change frequently. Happily, playing this one solo gives you a great taste of the fast paced hacking and slashing, though having it on the Switch means you can play it with friends anytime you want to. Opus has a lot of charm. You’re playing as the robot Emeth, a cute little guy who is looking for the now mythical planet Earth. In this adventure game, you’re given coordinates and a general description of the area, and then use a telescope to scan for the planet you need by using the analogue sticks and some deduction. You put your cursor over planets and scan them until you find a particularly Earth-like one, and then you can name it, too. These little puzzles aren’t super challenging, but they are relaxing and satisfying to complete. I also got really attached to Emeth, though your mileage may vary on tiny adorable robots. When I first wrote about Implosion, I called it trash and I meant that in the most affectionate way possible. Implosion is messy—combat can feel floaty and boss fights are more a matter of mashing buttons than anything too skill dependent—but it’s the messiness that makes the game appealing. It’s a port of a 2015 mobile game that feels a bit like futuristic Diablo. It had robo-dogs, cheesy comic book cutscenes, and giant swords. It’s the video game version of movie theater popcorn: a bit stale but filling nevertheless. If you’re looking to tune out on the subway, Implosion’s a great choice. Battle Chef Brigade mixes multiple genres together in an effort to translate reality cooking contests into game form, and somehow, the marriage of beat-em-up and match-three melds effortlessly into one cohesive plate. It manages to capture the feeling of rushing to get that last plate together, juggling multiple entries for chefs with differing palates, hunting monsters and all the tracking a shopping list in your head for when you set the ingredients down to cook. 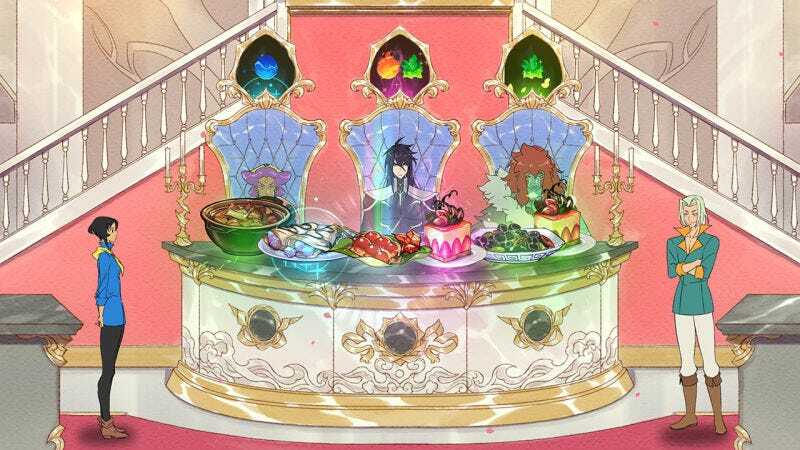 Clever twists like bones and rotten gems push the player to master the matching game, and Battle Chef Brigade’s world is full of wonderful characters and lighthearted writing. It is The Great British Bake-Off of video games, and in my opinion, one of the best indie games on the Switch. My policy regarding stealth sequences in video games has historically been “stop sneaking.” This game changed all of that. Somewhere between its catch James Bond-ish theme song and it’s hilarious Nintendo 64-era 3D cutscenes, I fell in love with Never Stop Sneakin’. It’s a top-down game that distills stealthily infiltrating an enemy base into its simplest form, creating a fast-paced arcade-style experience that’s sublimely satisfying. Are you a bad enough dude to rescue all of the presidents, even the bad ones? Gorogoa has layers. On the surface, it’s a unique, visually striking puzzle game about swapping, juxtaposing, and stacking gorgeous hand-drawn panels to solve clever puzzles. But dig a little deeper and you’ll find a story about one man’s lifelong search for meaning. It’s a brief experience that’ll take you just a few hours to finish, but you’re guaranteed to be thinking about Gorogoa for long after you’ve put its final piece into place. Lichtspeer is delightfully bizarre. In this game, you play as a warrior that’s been summoned by a bored god to slay monsters with a neon pink spear for their entertainment. You’ll go through increasingly more crowded stages slaying flying dogs and zombies. Lichtspeer is the kind of game that’s discovered how to do one thing really well (throwing spears), so it never gets boring to headshot a giant. This might be the first roguelike game that’s clicked for me, and I think it has at least a little bit to do with playing it on the Switch. This is a side scrolling game that has you fighting and jumping through randomly generated stages, but what I really like is how good it feels to jump in this game. Ikk, the character you play as, has a weighty jump where they hang in the air for less than a second before falling. There’s something particularly tactile about that when you’re playing in handheld mode, with the screen inches from your face. If you need more convincing, the art and music are both delightful as well. When you enter a room, you’re spat out of a giant worm, and when you exit it, you’re eaten by another one. Who wouldn’t love that? This game is bonkers. It’s a card game about breeding sheep and then also all the horrible things that can befall a sheep during its lifespan. Your goal is to fill your board with high-value sheep cards without sacrificing too many sheep to natural disasters. Plagues, wolves, disease, meteors—there’s a card in your deck that will have this method of death, and more. In the story mode, after each challenge you’ll also watch a morbid motion comic about the plight of these sheep as they look for their master. It’s completely absurd and I love every minute of it. This new Nintendo Switch game about sheep is a little bit horny, and also very morbid.